The Model 87 Elliptical Head Shearing and Flanging Machine utilizes precision hydraulic tracing in order to fabricate tank heads that are oval in shape. Likewise the machine can fabricate tank heads that are round in shape. These tank heads can be flat, dished, as well as reverse dished. 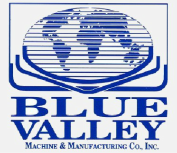 The Model 87 is the current version of the Blue Valley Elliptical Head Machine. An Elliptical Head Flanging Machine was first introduced to the world in 1939. This machine was developed by Mr. Ernest E. Johnson. A few years later a Shear was added to the machine. A template is made to the exact shape and size of your finished product. The Shear and the Flanger follow the edge of the template and accordingly shear and then flange the tank head to the template. A 10 HP Electric Motor is used to drive two Pressure Compensated Hydraulic Pumps. The machine has two hydraulic circuits - one for the Hydraulic Motors, and one for the Hydraulic Cylinders. The Model 87 is able to produce tank heads with a 94"/2400 mm major axis in about 12 - 15 minutes. ​Couple the Model 87 with a 1625 Head Dishing Machine for the production of elliptical dished tank heads.